Wasko’s, located at 223 Gay Street, is one of Phoenixville’s best kept secrets. Off of the beaten path of Bridge Street, this small sandwich shop is becoming well known, and deservedly so, for their roast pork sandwiches, pierogies and kielbasy. They also serve up delicious prime rib sandwiches along with more standard hoagies. 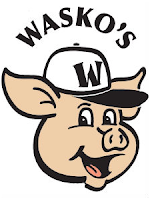 Wasko’s is owned and run by Jim Wasko, a Mont Clare native, who opened the restaurant a little over two years ago. At the time, Jim had little experience as a cook but felt this was his life’s calling and has been learning ever since. A quick glance at Yelp shows that he is a quick study. Wasko’s is open every day but Sunday, from 11-6pm Monday-Thursday and Saturday and 11-7pm on Friday. Their phone number is 610-933-6720. For more information including their full menu, visit waskoscatering.com.